The AJ Fuller is a large 229' three masting sailing ship that sank in Elliott bay in 1918. Do to the vessel's size it is difficult to image. Even on a 500' scan the ship takes up most of the screen. AJ Fuller - The square object at the bow is actually artifact created by moving the side scan units angle around the bow. We needed to change course to avoid ferry traffic. 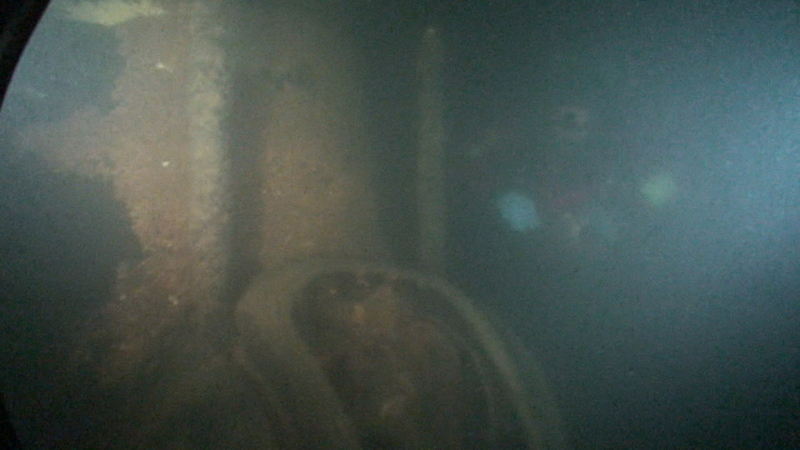 Note the barge to the left of the Fuller's stern. This image is the Fuller taken from the side. The hope was to cast shadowing of any deck structure. As you can see little shadowing is evident. Due to the ships size we passed directly over midship and scanned the bow (Left) and then the stern (Below).